Since The Pre-Sequel was a considerable disappointment (and 2K and NVIDIA seem to be taking their sweet time porting it to SHIELD hardware in any case), Tales from the Borderlands is the only game in town for the massively popular shooter IP. That's OK, because TellTale is doing a fantastic job with the odd mix of sci-fi and comedy that the series is known for. The fourth episode in the adventure game story, "Escape Plan Bravo," went live for the Play Store version of Tales from the Borderlands today. This is the fourth of five total episodes, so things are starting to heat up for our protagonists Rhys and Fiona. I won't spoil anything, but Escape Plan Bravo features some of the heaviest story beats yet. That said, there's still plenty of great character-driven humor, so those who've followed along thus far won't be disappointed. Episode 4 takes place on Pandora's moon Elpis, the setting for The Pre-Sequel, which is in no way, shape, or form Space Australia. Go Space Broncos! Like all the previous episodes, Escape Plan Bravo will run you $5 for about an hour's worth of play time, or you can save $5 by buying episodes 2-5 in the Season Pass. 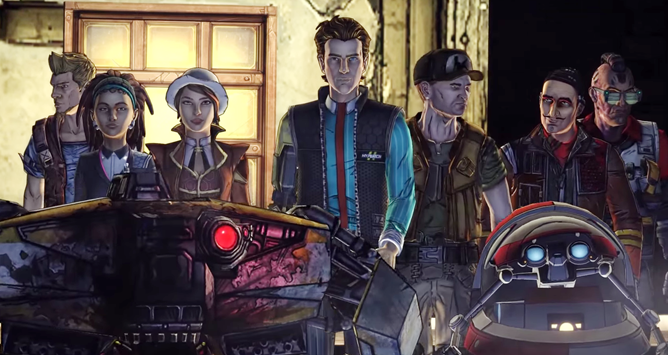 Tales From the Borderlands should wrap up in a few weeks with the final episode, Vault of the Traveler.